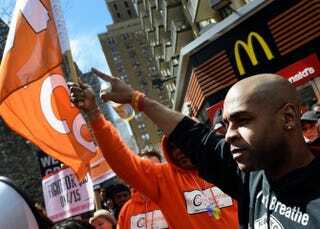 Protesters gather outside a McDonald’s restaurant in New York April 15, 2015, to rally as part of the “Fight for $15” minimum wage movement. Almost two years ago, McDonald’s worker Nancy Salgado was arrested after calling out former McDonald’s USA President Jeff Stratton for the criminally low wages the corporation pays employees. Since that time, the #FightFor15 grassroots organization, which demands that the minimum wage be raised to $15 per hour and that a union be created for fast-food workers, has grown in scope to encompass home care and child care providers along with retail employees. Supported by several members of Congress, including Rep. Keith Ellison (D-Minn.), Rep. Yvette D. Clarke (D-N.Y.) and Sen. Bernie Sanders (I-Vt.), these workers joined with allies from coast to coast Wednesday to shut down McDonald’s locations in protest. This movement is necessary to create a society where the working poor do not have to live on public assistance while simultaneously being stereotyped as lazy, ignorant and uneducated. It should not be controversial to expect to be compensated commensurate with your labor within a billion-dollar corporation and the rising cost of living; it should be a matter of course. This is why I’ve been appalled to see the opposition to #FightFor15. According to one survey conducted by USNews.com, 77.44 percent of those queried are opposed to the movement, while 20.56 percent are in support of it. The debate on social media is steeped in racially charged undertones, including criticism from some card-carrying members of the so-called Talented Tenth who are apparently disgusted that less-educated people would demand respect. These are the people who will take their degree, head off to a minimum-wage-paying job that barely makes a dent in their student loans, and be proud as long as they can do it in a suit and tie. You know, that respectable intraracial classism that promulgates the “Black People vs. Niggas” fallacy. Wake-up call: It doesn’t matter if you’re answering your boss’s emails or making sure customers are having it their way and “lovin’ it”—you’re more than likely getting screwed over, too. I refer to the following quote from Malcolm X often: “You can’t have capitalism without racism.” This fight for livable wages, and McDonald’s tepid response to it, makes that abundantly clear. They sell workers the American dream and hide the nightmare in fine print, implicitly framing racism as a sound business decision. The con is that when rich white people are getting richer and poor people of color are getting poorer, it’s impossible to tell where capitalism ends and racism begins. “We believe that any minimum wage increase should be implemented over time so that the impact on owners and small and medium-sized businesses—like the ones who own and operate the majority of our restaurants—is manageable,” McDonald’s said in a statement. So, to be clear: They’ll put Calvin in commercials, sponsor Tavis Smiley’s Black State of the Union, proclaim themselves “deeply rooted in the community,” tout their diversity and even make an African American head brother in charge. But when it comes to paying black and brown people a livable wage? When it comes to black and brown people being able to feed their children or go to the doctor or maybe even enjoy themselves on occasion without having to worry about getting evicted? Well, in that case, they should just hold on a little bit longer so the lives of wealthy business owners won’t be disrupted and equality won’t be too jarring for them. It’s not a reach to call this economic violence. The same white supremacist system that devalues black and brown lives and denies them dignity even in death is the same system that creates food deserts for low-income citizens. It is the same system that denies them sufficient health care or makes it so unaffordable that it’s inaccessible; and it is the same system at work here. Education is supposed to be the great equalizer, and maybe that’s so for many people, but this is also the same system that closes public schools, tests and prices our low-income children right out of that education, then judges them for working at McDonald’s while paying them barely enough money to get by. And for those who say, “We should be teaching our children to be entrepreneurs and not depend on white corporations,” you’re right; we unequivocally should. The rocky road to self-determination, including detours into the inherently racist business-loan process and lack of community support, is a conversation well worth having. In the meantime, there is no honor lost in demanding fair wages. This isn’t Good Times, and we “ain’t lucky we got ’em.” Solidarity is the key here because, without a doubt, #FightFor15’s aim to unshackle low-income workers from economic slavery is one of the great civil rights issues of our time, and it ultimately affects us all.